Prepare a wide variety of foods in the Magic Chef 1.6 cu. ft. Over-the-Range Microwave in Stainless Steel . Quickly boil, re-heat and defrost food with the 1,000 watts of cooking power and 10 cooking levels. Six pre-programmed auto-cook menus help you cook favourite foods quickly, while the auto defrost sets the correct power level automatically. The 1.6 cu. ft. capacity provides ample space for dinner plates and small casserole dishes, and the 12 in. recessed, glass turntable helps ensure foods are cooked evenly. The Nouveau Wave offers 1.2 cubic feet (34 litres) of interior cooking and heating area with a maximum power output of 1200 watts. It features durable white interior with glossy white exterior. Cleaning is a breeze with the XpressClean interior, and the Eco-button feature saves energy by dropping the overall power consumption to less than 1 watt when the microwave is not in use. The state-of-the-art electronic controls are a breeze to program and monitor via the easy-to-read blue LCD timer and clock unit and includes two defrost options, an auto reheat and power level option as well as our popcorn time toggle, designed to pop every kernel to perfection. 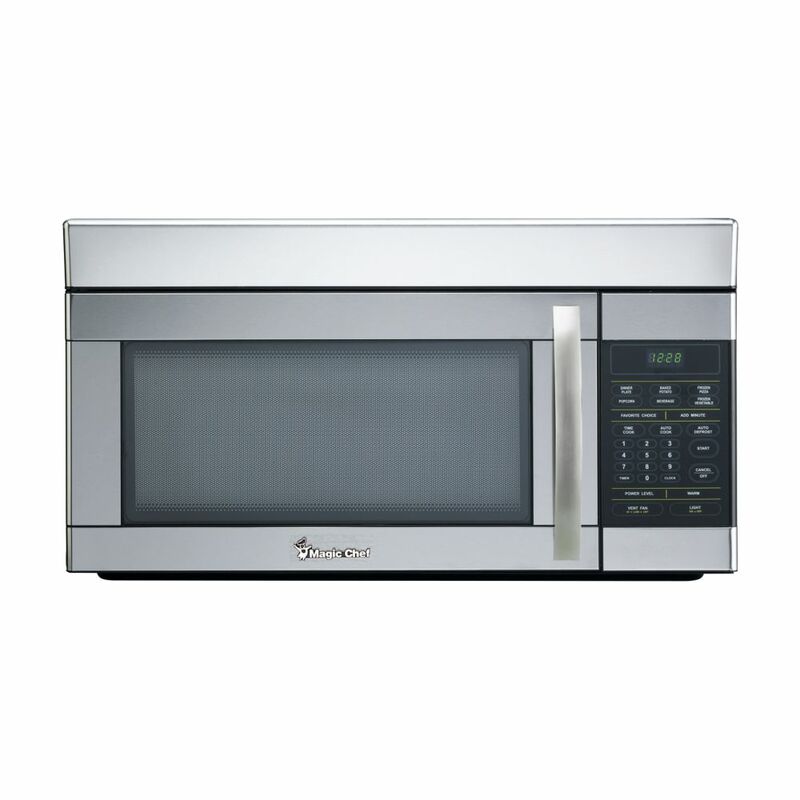 1.6 cu Feet Over the Range Microwave - Stainless Prepare a wide variety of foods in the Magic Chef 1.6 cu. ft. Over-the-Range Microwave in Stainless Steel . Quickly boil, re-heat and defrost food with the 1,000 watts of cooking power and 10 cooking levels. Six pre-programmed auto-cook menus help you cook favourite foods quickly, while the auto defrost sets the correct power level automatically. The 1.6 cu. ft. capacity provides ample space for dinner plates and small casserole dishes, and the 12 in. recessed, glass turntable helps ensure foods are cooked evenly. 1.6 cu Feet Over the Range Microwave - Stainless is rated 2.0 out of 5 by 2. Rated 3 out of 5 by Ronners from Works like it should. Looks nice and works like it should but cheaply made compared to the Magic Chef over the range microwave I had before. The door is cheap and when I was installing it, one of the nuts wasn`t working properly so I had to improvise. It`s in, it`s working and it looks good. Good price too. That`s why I decided to follow through with the install rather than try to return it. Rated 1 out of 5 by Marina85 from Bad microwave, bad customer service I bought a magic chef microwave in September 2017. After a month start very loud noise when I used vent fan. I went to Home Depot, they told me to call to magic chef.... and then it starts, they didn’t answer on their business hours, Didn’t call back after I left couple messages. I went again to the Home Depot, just after call from home Depo, magic chef called me back. Their technician came after about two weeks, he told me what I need a new vent and he will come in 7 business days. It was in first week of December, now it’s January 9th and I still with same problem.